I love bread. It is likely part of why I am the Old FAT Guy. My favourite is whole wheat bread. 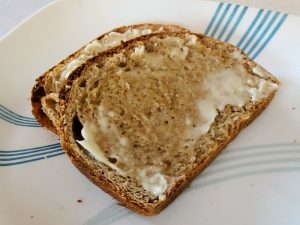 I normally make my bread with a mixture of white and whole wheat flours because that makes a nice light loaf but still gives me the nice taste of the whole wheat. Sometimes, I just want the great full taste of 100% Whole Wheat Bread. It is just so rich, almost nutty, in flavour. 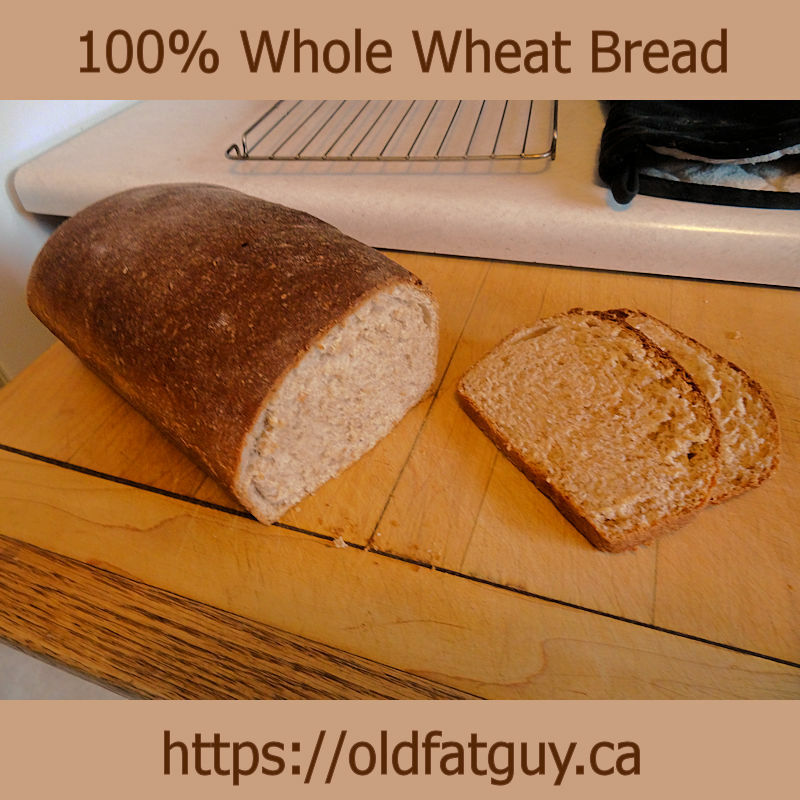 The problem is it is not possible to get as light a loaf with all whole wheat flour. There is just less gluten and it doesn’t rise as much. This isn’t a bad thing as long as you get a fine, soft, moist texture. The coarser loaf is better with fatty meat sandwiches in my opinion. Before I get into the recipe, a small lecture. If you make bread, buy a weight scale. It is almost impossible to accurately measure flour in cups or milliliters. It can pack down and different manufactures mill finer or coarser. You will get better bread if you weigh the flour. I have included volume measures but get a scale. So ends the lecture. If you will be mixing by hand, only put 1/2 the flour in the bowl and reserve 1/2 for later. Heat in 30 second intervals in the microwave until the temperature is between 120-130 F (49-54 C). It you are mixing with a stand mixer, put a dough hook on the mixer and pour the liquid over the dry ingredients. Mix until the dough just starts to cling to the dough hook. Continue kneading for 4 minutes. Scrape the bowl down and knead for 3 more minutes. Cover and let rest for 10 minutes. If you are mixing by hand, pour the liquid ingredients over 1/2 the flour mixed with the other dry ingredients. Mix to a batter. Add the flour a little at a time until it gets too stiff to stir. Turn the dough out onto a floured counter. Knead the dough, adding the remaining flour a little at a time, until all the reserved flour is combined. Knead for 8 minutes more. Cover and let sit for 10 minutes. 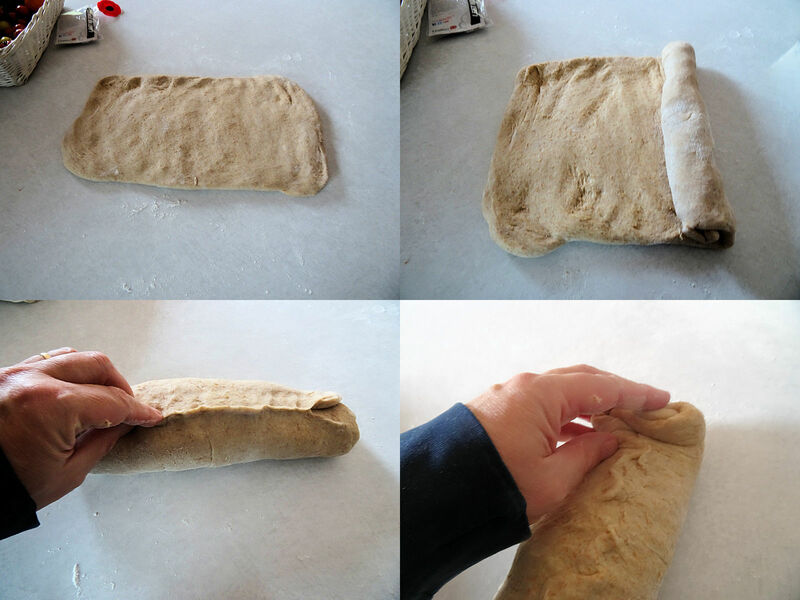 Stretch the dough into an 8 inch (20 cm) by 12 inc (30 cm) rectangle. Roll the dough into a log. Pinch the seam to seal. Fold the ends over and pinch to seal. Put the loaf in a bread pan that has been sprayed with baking spray. Cover it with a towel and let it rise in a warm place until doubled, about 45 minutes. Heat your oven to 375 F (190 C) and then bake the bread for about 50 minutes to an internal temperature of over 200 F (93 C). Turn the bread from the pan and let it cool on a rack. I can never resist cutting some slices while the bread is still warm. It doesn’t slice as easily but it is so good! This is one of my favourite bread loafs. It tastes like a whole wheat bread but has a fine moist texture that makes a great sandwich. However, I often just eat it with butter. It isn’t as light as a white bread but it does have a soft interior. Be kind to yourself, make some 100% Whole Wheat Bread! Mix, flour, yeast, skim milk powder and salt together in the bowl of your stand mixer. Mix the water, milk, oil and honey together in a microwave safe container. In thirty second intervals, heat the liquid until it is warm, between 120-130 F (49-54 C). Pour the liquid over the dry ingredients. Put a dough hook on the mixer and mix until the dough just starts to cling to the hook. Scrape the bowl and hook and knead for 3 minutes. If mixing by hand, mix 1/2 of the flour with the yeast, skim milk powder and salt in a large bowl. Pour the liquid over the dry mixture and stir into a batter. Add the flour a little at a time, mixing between additions, until the dough is too stiff to stir easily. Turn the dough onto a floured surface. Knead the dough, adding the remaining flour a little at a time, until all the reserved flour is combined. Knead for 8 minutes more. Cover the dough and let it sit for 10 minutes. Stretch the dough into an 8 inch (20 cm) by 12 inc (30 cm) rectangle. Pinch the seam to seal. Fold the ends over and pinch to seal. Spray a bread loaf pan with baking spray. Put the formed bread into the pan. Cover and let rise in a warm place until doubled, about 45 minutes.